Since mushrooms are grown all year, our compost is available all year. 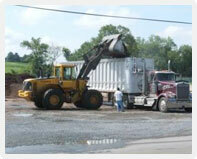 We deliver in tri-axle dump trucks (25 cy) and walking floor tractor-trailers (55-60 cy). Please request a quote for pricing. We do allow for self pick-up quantities. The minimum quantity we load is 25 cy for $125. Anything over this amount is $265. We do not recommend a dump trailer because the compost will settle during shipment and the trailer may tip over during unloading. For self pick-ups please contact Fastrak Express at 410-658-0520 to arrange a time and payment. We load M-F from 8-4. No major holidays or weekends.